Are your current testing methods lacking the ability to detect critical vulnerabilities? Do you find the application review process to be too lengthy or require a way to test unfinished software? Code analysis tools are an option for assessing source code at any point in the development life cycle. They offer an automated form of static analysis capable of checking source code prior to release or after implementation. Why Use Code Analysis Tools and What Can Be Gained From Such a Process? Manual analysis is a lengthy process that requires knowledge of an entire code base, system architecture to identify vulnerabilities effectively. As application size grows and systems become more complex, it requires extensive amounts of time and is not a guaranteed method for achieving a reliable implementation. Automated code analysis tools offer repeatable, objective measurements for continuous monitoring of software quality, technical risk, technical debt, and excessive complexity. Why Are Code Analysis Tools Metrics Important? Thousands of lines of source code make it impossible to perform an accurate manual assessment of an application. Objective and standard metrics generated by code analysis tools may be used as part of a dependable assessment process where improvement efforts are possible to maintain software integrity as rapid development takes place. Code analysis tools metrics supply a base measurement for monitoring the development life cycle as changes are made or new software must be implemented within a complex infrastructure. In the end, organizations choosing to use automated code analysis tools gain great insight about the current state of developer's code and can easily find ways to boost overall quality, and reduce rework. Also, be certain application service providers are meeting coding, architecture, and quality standards from both a technical as well as governance perspective. Static analysis can be performed in various ways with automated solutions offering the most benefits. 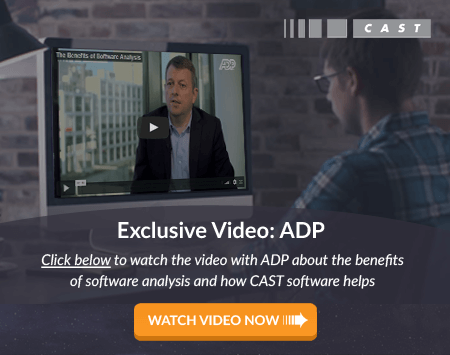 CAST Application Intelligence Platform (AIP) is an enterprise-grade code and application software analysis platform that analyzes source code to provide consistent measurement for monitoring code quality improvement efforts. If your organization has been struggling to maintain quality, meet architectural standards, or if it suffers from infrastructure problems due to undetected vulnerabilities, then a dependable automated code analysis tool is essential to resolve these issues. Learn how automated code analysis tools can greatly enhance your development process and system reliability. To see how we can help you, get a free demo of our code analysis tools today!